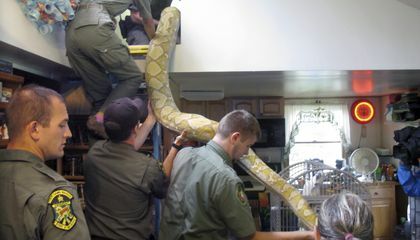 Two giant Southeast Asian pythons that were rescued by a snake collector were turned over to Vermont game wardens. They are now headed to a sanctuary. The larger of the two reticulated pythons, picked up Aug. 25 by experts from the Massachusetts-based Rainforest Reptile Shows, was a female. The experts had help from three Vermont game wardens. They python was between 17 and 18 feet long. It weighed about 220 pounds. A slightly smaller male was about 15 feet long. It weighed about 150 pounds. "Come feeding time is the most dangerous time to be around a snake," said Howard. He has kept snakes for decades. He has almost two-dozen smaller snakes in his North Clarendon, Vermont home. "That's when anything goes. And you certainly want to be out of the way. A snake that size got ahold of you, if you didn't have any help with you, you're a goner." The reticulated python is named for the geometric patterns on its skin. It is one of the largest snake species in the world. It can reach almost 30 feet long and weigh 350 pounds. Pat Howard is smart about snakes because he is able to realize when he won't be able to take of snake anymore as he said. I believe that Pat Howard is wise to be able to know when he isn't able to take care of a snake anymore so he or anybody else gets injured. Big snakes are moving from one state to another because of their size. One day they were small and the next they are huge. These Asian Pythons are traveling and they they going to need to have a better life in the new state that they are going to. That is one very big snake and it looks very dangerous but why would they keep such evil looking creatures like this one because I am afraid that someday it will bite them. And they look way stronger and bigger than a human. Eww snakes!How do they touch the snakes with bare hands?! The workers must be tired of watching, feeding, and caring for the snakes. The snakes must have been tired to go to Massachusetts in the car. I think that what Pat Howard has done was the right decision. The reason why I think that is because snakes that are humongous are very dangerous. I believe that handing over the Southeast Asian python was safe to himself and others around him. I also think that handing over the pythons to professionals is the right thing to do since if you were to hand it over to a friend or an amateur, there would be a huge problem. I found this article interesting because the found a 17-18 feet long python and 220 pounds. They were so big they safety couldn't take care of them. Feeding is the most dangerous part. If they got a hold of you you wouldn't stand a chance. They can reach 30 feet long and350 pounds. The snakes were to big for his booth so Chad Barrett took care of them and they were the biggest snakes he'd dealt with. 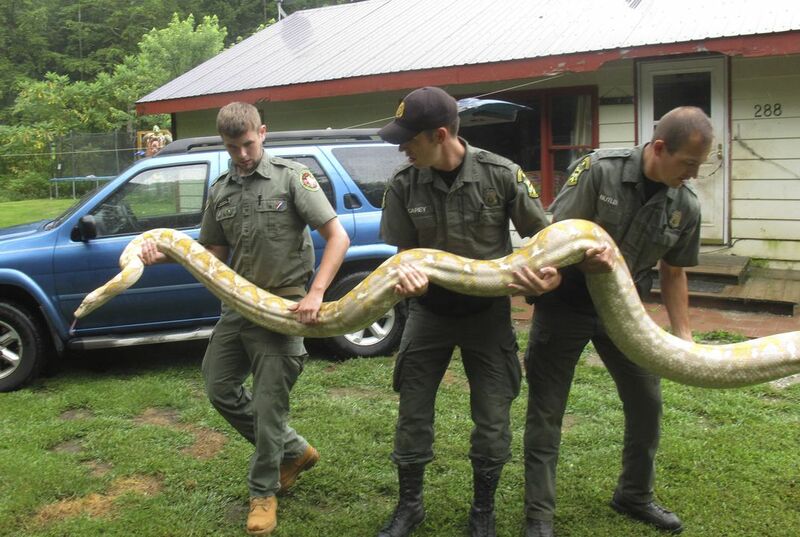 I found this article interesting because they found pythons 17-18 feet long and 220 pound. They were bigger than security could take care of. Coming of feeding is the most dangerous part. If they got a hold of you, you would be a goner. They can get to 30 feet long and 350 pounds. They were to big for Howard's booth so Chad Barrett had to take them. I think that it is cool for the two reticulated python two be two of the biggest snakes that are larger than the other species of reticulated pythons. The two other pythons that had been rescued might be the biggest snakes that its own species that they are in.